Something I forgot to mention: If anyone has recommendations (favorites) to share, I'd enjoy hearing about them. Several of the lesser-known movies on my list--Blood Simple, In Bruges, The Spanish Prisoner--I would never have known about, otherwise. John, Several of the movies on your list this year are included on mine. I believe you love lists as much as you do movies and wonder if your wife makes "honey-do" lists for you. Well, John, since your request went up almost at the exact moment as my comment, I'll add one old movie that makes my list every year. SEA OF LOVE. I'm not quite sure why, but I've watched that movie hundreds of times. Fran, I liked that one too, but I like almost all Pacino movies. And almost anything that features John Goodman. I can't figure out this fondness I have for lists. In everyday life I make them so I won't forget something important. And no, my wife's not much of a listmaker. We've been married so long now, she just points and I salute and do what she wants done. Great list, John! We share many (most) of those as favorites. How about "A Simple Plan" and "The Last Supper"? How about Millers Crossing, Lucky Number Slevin, and The Lookout? John, A great list. A lot of my favorites on there as well. I would also include "Anatomy Of A Murder". I "discovered" In Bruges on the recommendation of Kurt Sercu, proprietor of Ellery Queen a Website on Deduction. Kurt, Martine and their children live in Bruges. After seeing the movie he sent me an email chronicling the things that were "wrong" or changed about the town in the movie. The list would make an interesting article on its own. To Kill a Mockingbird is not only a great movie but the source of a lot of trivial pursuit questions, viz., who played Boo Randall (in his first role) Answer, Robert Duvall. And who was Scout's summer friend modeled after? Answer, Harper Lee's life long friend Truman Capote. BTW, I have been off all week due to lack of internet in Tortola. Somehow it just clicked back on. Typing this while gazing down on Smugger's Cove. And, on the lighter side of things, "The Cheap Detective" (one of my all-time favorites), "Clue", "Murder by Death", "The Wrong Box" and "Manhattan Murder Mystery". Thirty films and no Basil Rathbone pictures? Other than that glaring omission, I enjoyed the list, John. Too many good movies, too little time . . .
John, you KNOW how I love movies, too! 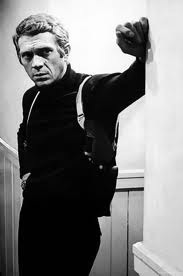 My all-time favorite is another Steve McQueen film, Papilion. EVERY time I fnd it on TV, I am powerless to not watch it. It is a great story, a true story and one of such determination. I also was told your choice movie tells a lot about you. So, interesting choices everyone. Great list, and bravo for including little seen gems like Spanish Prisoner, which was directed by David Mamet. Another little-seen gem he wrote and directed is House of Games. Thanks, James. I absolutely loved The Spanish Prisoner. I promise I'll see House of Games as well. I think Mamet's best was probably Glengarry Glen Ross. Great movie. Deborah, you're right about Papillon. I saw it again a few weeks ago. A wonderful story of the human spirit.